Well it’s that time of the month again for The Home Bakers number 18 bake from recipe book “Coffee Cakes” by Lou Seibert Pappas. This recipe was selected by Janis from The Kitchen Is My Shrink and for those of you who have been following me will know that only the host of THB club can state the recipe on their blog. The weekend just gone was a long weekend here in Austria and my plan was to do nothing but relax and try to update my blog as I have been so busy with work that I haven’t been able to keep up. 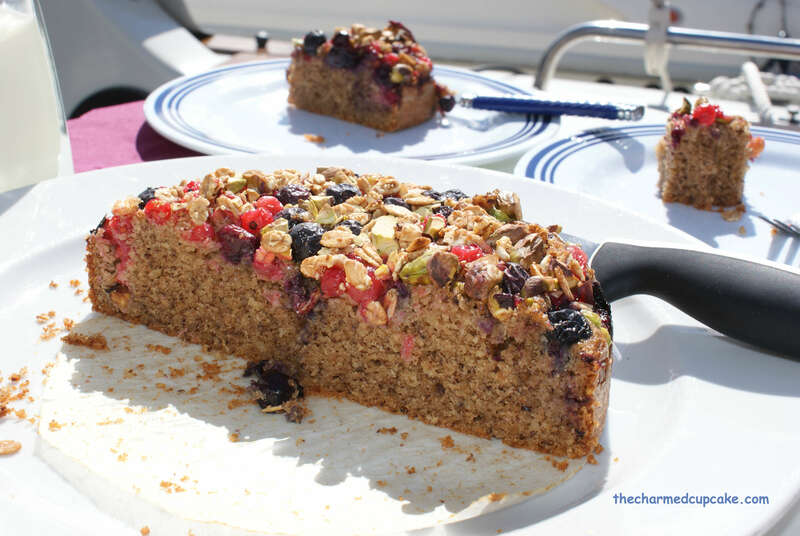 But of course I couldn’t resist and when we were spontaneously invited to spend time with friends on their boat I knew I had to bake this recipe as a treat for us all. 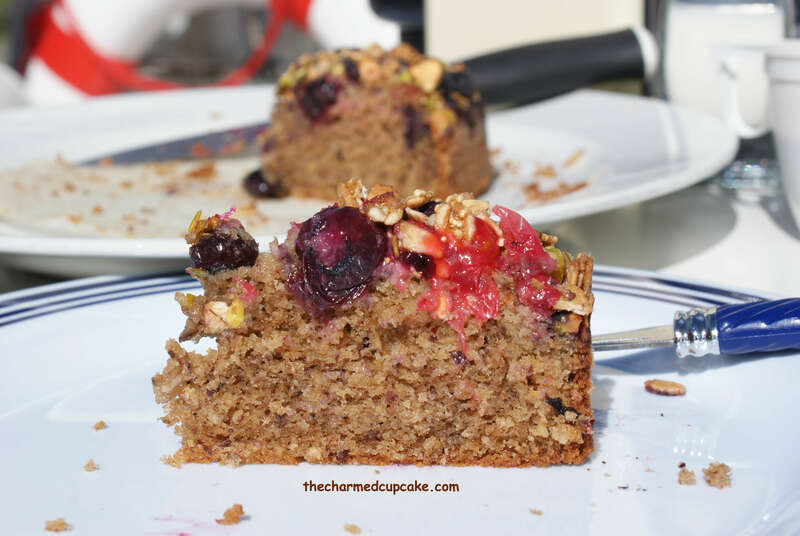 As it was a holiday, the stores were all closed so I had to raid my pantry, fridge & freezer to see what ingredients I had in order for me to bake this cake. The original recipe called for marionberries. Now I have no idea what the name is in German to be able to find it in the supermarket but technically, marionberries are a particular breed of blackberry which we have plenty of here in Austria but it’s just not the season. I might have to try this recipe again when summer rolls around as we can pick fresh blackberries in the forest. So back to my kitchen, luckily I had a good supply of hazelnut meal and frozen berries. Unfortunately I had no whole hazelnuts or almonds, instead I used pistachio and mixed crunchy muesli to give it that crunch. For the full recipe please be sure to visit Janis from The Kitchen Is My Shrink. Being out on the water was truly relaxing, the boys got to have their fun with the boat and us girls relaxed catching the sun’s rays whilst drinking bubbly. By the time late afternoon rolled around we were all eager for coffee and cake and I was dying to cut into it to see and taste the results. I was very pleased, the cake was delicious and moist. 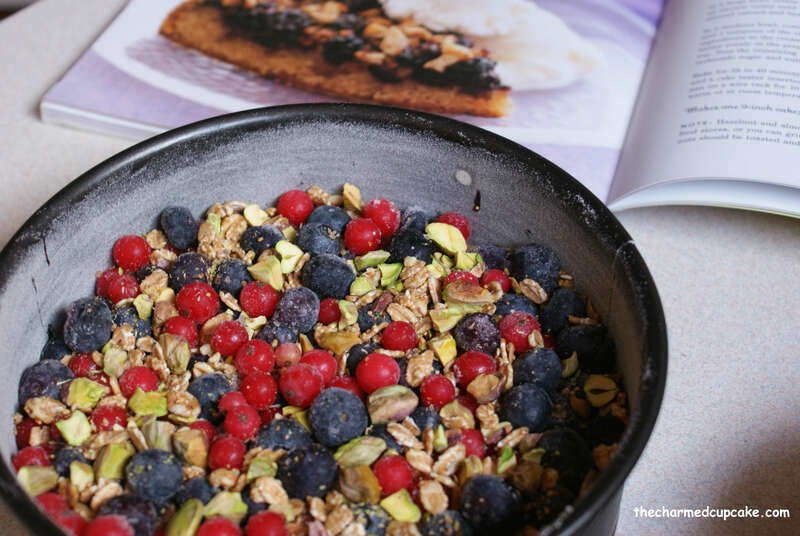 The rich nutty hazelnut flavour matched well with the berries and because pistachio nuts are not as crunchy as hazelnuts or almonds, this is where the crunchy muesli stepped in. 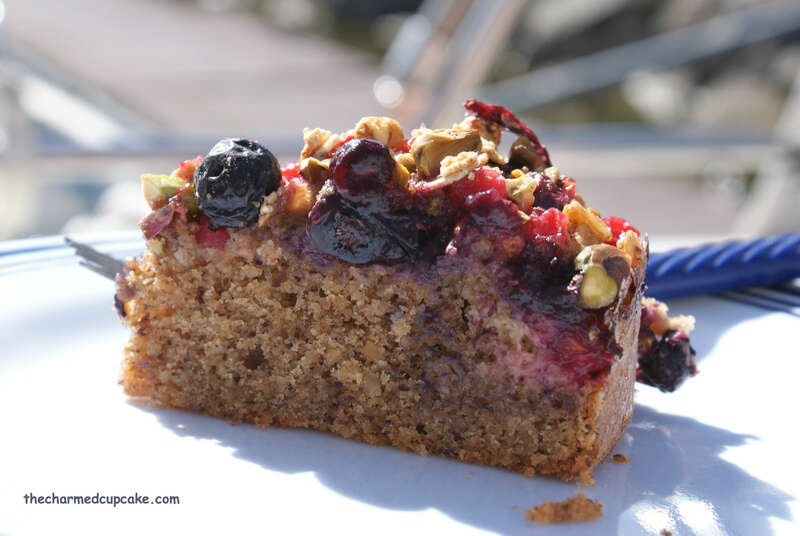 I also loved the colour contract of the red currants mixed with the blueberries and the pop of green from the pistachio nuts – a great spring and/or summery cake. Something to take note when using frozen berries was the baking time, which I only just noticed Janis mentioned too. The baking time was slightly longer than stated. My frozen berries also had slight water crystals and by the time baking was up I did notice there was still some liquid amongst the berries. When I did the skewer test the cakes were not quite done so I baked them for 5 minute intervals, checking them each time till they were done and they both turned out great. We all really enjoyed this cake, it is definitely a keeper when you notice your friends have more than two slices in one seating. Please do pop on over to The Home Bakers and see how my fellow bakers went with baking this recipe. 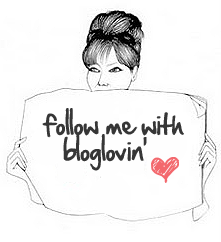 If you would like to join us then please contact Joyce from Kitchen Flavours, we would love to welcome you on board. Thanks Bam 🙂 wishing you a lovely weekend too my dear. this looks nice for a Spring or Summer dinner party! 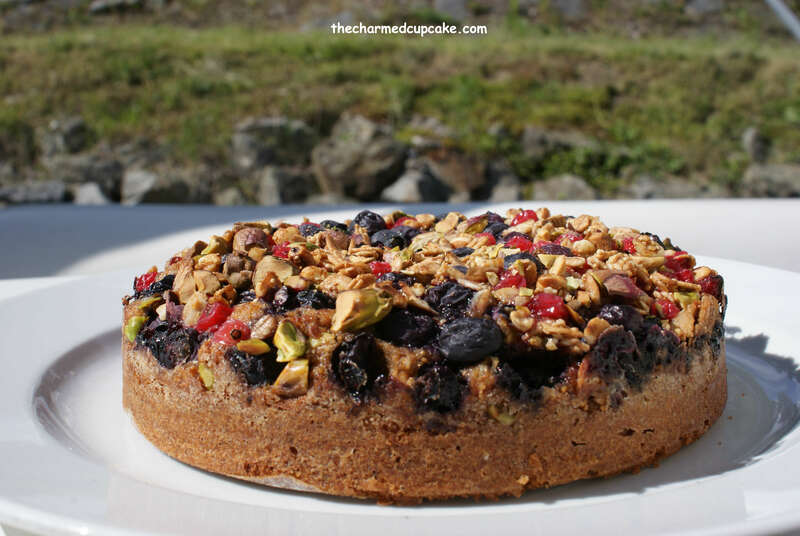 Wow, your cake is looking very pretty with all the mixed berries and nuts! 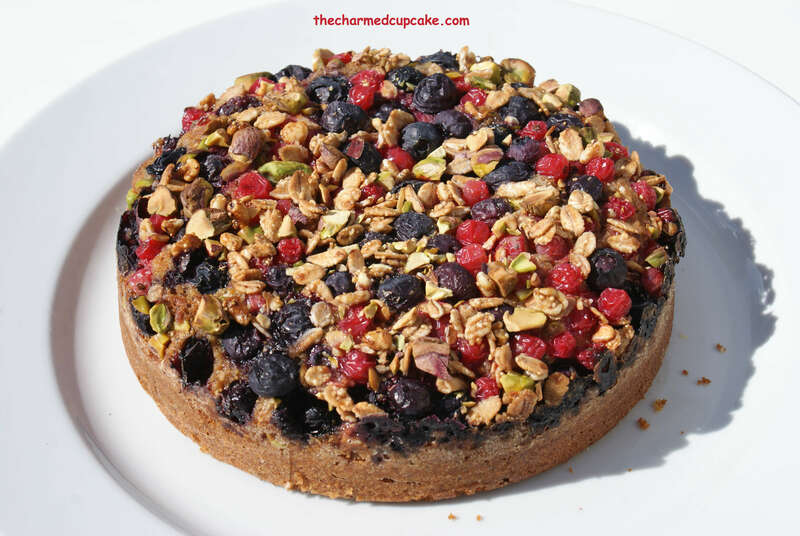 A great idea with the crunchy muesli! And this is another keeper recipe from this book. Your outing with your friends sounds like fun! 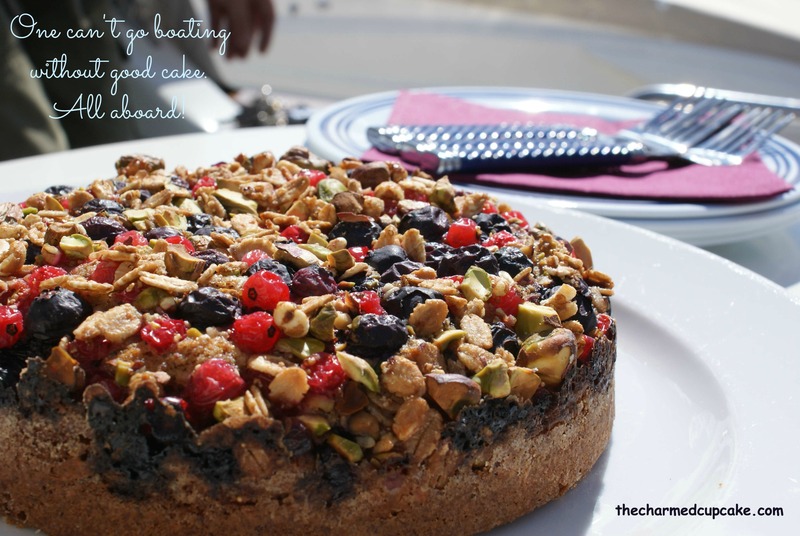 Seeing your friends took a second helping with the cake really meant that they love it! I love that when that happens, makes the effort of baking so worthwhile! Haha!